Powerful and inspirational workshops on confidence related topics! Suzanne Fetting is passionate about life and lives her daily life engaged in activities requiring ABSOLUTE CONFIDENCE. She not only teaches confidence, she lives it! 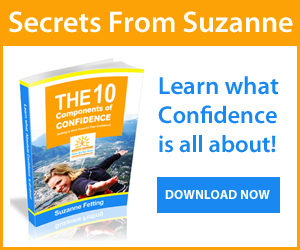 Whether for a group of 10 or 1,000 people, Suzanne will draw from her extensive background as a highly regarded expert in the area of confidence and self-esteem. She is a vibrant and engaging professional speaker and keynote speaker, who has spoken at numerous trade shows, conferences, networking events and workshops. 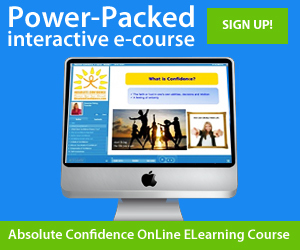 She ABSOLUTELY loves helping people better understand and develop their confidence. Through personal stories, powerful exercises, role playing, interactive conversation, and critical thinking, each presentation will prove to be informative and dynamic, leaving your audience inspired and empowered with powerful skills, fresh thinking and renewed energy. Talks and workshops can be customized to your organizations requirements and based on the topics covered, can range in length from a one hour to a half day workshop. Each confidence related presentation can be presented on its own, as part of a larger program, as a breakout session, or in an expanded half or full day learning session that allows for an in-depth exploration of all of the Absolute Confidence Principles. Most women are intimately familiar with the antithesis of confidence: FEAR. There is a fabric of fear that underpins a women’s daily professional life: fear of speaking up, not being liked, rejection, conflict, imperfection, looking stupid, being judged, etc. Fear is a normal human emotion, but it can become all consuming and debilitating when it is not managed, and as a result, takes control of your mind and your ability to go after what you really want and deserve. This talk is focused on giving women insight into fear, its negative effects, and how it relates to confidence so that they can understand fears massive negative impact, how to overcome it and create opportunities and start living an awesome life! Learn how to create your life based on what you want, instead of what you fear! –go from DoorMAT to Door PRIZE ! ~Do you hide your feelings and not ask for what you want because you are afraid of how others might react? ~Do you often say yes, when deep down you would rather say no? ~Do you feel overwhelmed and underappreciated? ~Are you scared to speak up for yourself and share your thoughts and opinions? In this talk we will focus on the characteristics of an assertive woman, explore what currently prevents you from speaking up for yourself and sharing your thoughts and opinions, while learning practical tips and techniques for being assertive. Assertiveness involves actively expressing our thoughts, opinions and needs, while respecting the rights of others. It is the 10th Component of Confidence and is an absolutely essential skill to create clarity and happiness in both our work lives and in our personal lives. Learn how to stop being the doorMAT and start being the door PRIZE ! You’re most beautiful when you are being YOU, your authentic self! The relentless focus on appearance and our inevitable failure to attain the standards of beauty has become and epidemic! 60% of adult women have negative thoughts about themselves weekly, compared to 36% of men. And a whopping 78% of teen girls are plagued by self-criticism and 72% worry about their image everyday. As young girls we were socially conditioned to believe that attention and approval for being “good, perfect, or pretty” is a good thing, when in fact it makes it reeeeally difficult to build authentic confidence and sets us on course to continue looking for that kind of artificial reinforcement. Having AUTHENTIC CONFIDENCE is the most beautiful thing about a woman! Having absolute confidence is extremely important because when we know and appreciate who we are, we feel great about ourselves and we make better choices and better decisions. Everyone wants to be HAPPY! When you have absolute confidence you get the job you want, or ask for the promotion you deserve, you start that business you dream of, you attract great people into your life, you are empowered and excited about your life! In this talk Suzanne speaks about the fact that everything is based on our confidence and you can achieve anything when you believe in yourself! "Suzanne was a pleasure to work with as the keynote speaker for our event. She was extremely enthusiastic and responsive leading up to the event and receptive to suggestions in regards to catering her presentation to our unique audience (Women living with disabilities). In terms of the actual presentation, I found her to be extremely engaging and the information she shared to be both practical and relevant to everyone. Many of the ladies that attended our event came up to me to share how much they appreciated and benefited from her presentation. One of the many positive remarks that I heard in response to Suzanne’s presentation was that it was “Mind-blowing. Life-changing. Empowering [and] exactly what [she] needed to set [her] on [her] journey.” If you are looking to inspire confidence and empower a crowd, I would definitely recommend hiring Suzanne Fetting." "Suzanne, thank you so much for coming to talk to the women in the MBA program at UBC. We really appreciate you sharing your enthusiasm and passion for women to be their best selves." "Suzanne, thank you so much for coming and speaking to WIMDI this May. My group loved you, and they all learned a lot. I was so lucky to have you show up in my life right when I needed you, you are an angel thank you!"